Third Coast Terminals is the Premier Chemical Service Company of Choice. Third Coast Terminals is a unique provider in the chemical industry, offering services such as Reaction Chemistry, Toll Processing, Chemical Logistics, Terminaling, Blending, and Packaging. Strategically located in Pearland, Texas (2 miles South of Beltway 8 & near Hobby Airport), we are in the heart of the nation's largest petrochemical center, and next door to major ocean shipping facilities for the U.S. Gulf Coast. Customer satisfaction measured by the results of our Customer Feedback Report. Continually improving our quality management system by progressively reducing the number of non-conformances. Third Coast Terminals assesses key performance indicators and integrates best practices, driving towards continuous improvement. It is our belief that, above and beyond success in business, our team member’s health and safety must come first. Our team members are our most valuable asset we have and without them Third Coast could not exist or grow. A healthy and safe work environment is a right to which every employee is entitled, and we intend to preserve that right with them. 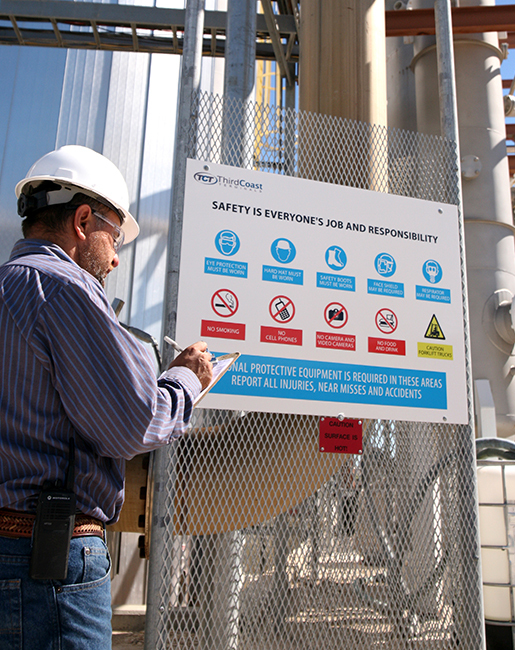 Provide a safe and healthy workplace for our team members. Provide dependability with consistent quality results. Provide the highest level of service to our customer’s at the most competitive prices. Create a partnership with all suppliers, customers and stakeholders. Copyright © Third Coast Terminals. All Rights Reserved.